The elite round draw is streamed live from 14:00CET on Friday with Barça, Chrudim, Sporting and Vytis to host November's groups. The UEFA Futsal Champions League elite round draw is streamed live from Nyon at 14:00CET on Friday with 16 contenders aiming for four finals pots. Teams are split into three seeding tiers: Main round Path A winners (position 1, 4 teams, Pot 4), Main round Path A runners-up (position 2, 4 teams, Pot 3) and Main round path A third place and path B group winners (positions 3 and 4, 8 teams, Pot 2). No main round group winners can face the runners-up in their group. Four mini-tournament hosts are named ahead of the draw and placed in a Pot 1, while maintaining their seeding. 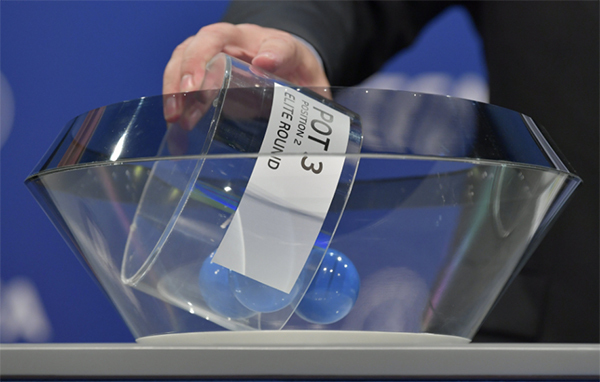 Pots 3 (position 2) and 4 (position 1) will then be drawn. Matches will be played 13 to 18 November. The four group winners will progress to the knockout finals, with one of those clubs appointed hosts for the event on 25 or 26 and 27 or 28 April. Inter are aiming for a record third title in a row and sixth overall. Other former champions involved: Benfica, Ugra, Kairat, Barça. Sporting CP have reached three finals, losing the last two to Inter. Kairat have been ever present in all 13 elite rounds under this format; Chrudrim are in their 11th but are yet to reach the finals. Sibiryak, A&S Futsal Pescara and Novo Vrijeme are making their debuts. A&S Futsal Pescara are the seventh different Italian side to reach the elite round, one more than Ukraine. Preliminary round survivors Vytis are the first Lithuanian team to reach the elite round, the 32nd different nation to be represented. Record Bielsko-Biala, who also came through the preliminary round, have also reached the elite round for the first time.